What do you do when you’re trying to turn a 20,000-square-foot warehouse into a coworking and incubator space for virtual and augmented reality startups? You put on your headset, of course. That’s exactly what Upload CEO Taylor Freeman and Upload’s expansion manager Avi Horowitz did when they started working on the company’s new headquarters in Venice, Calif. Thanks to a partnership with construction virtual reality specialist IrisVR, they were able to turn the plans for the office space into a 3D VR model, which they could explore with VR headsets to figure out which walls had to be moved and which spaces could be used for what purpose. Freeman and Horowitz recently gave Variety a tour of the office-in-progress in the real world, sans headsets, laying out their ambitious plans while contractors were still working on finishing interior walls. Upload plans to officially open its co-working space on April 13, offering anyone working on virtual and augmented reality a variety of work spaces, ranging from floating desks that you’d have to share with others to dedicated offices for a select group of VR startups. Companies and freelancers housed in the facility will be able to make use of a number of demo stations set up for room-scale virtual reality, as well as a capture room designed to turn real humans into 3D assets and a soundproof music studio. Also housed in the same building is an educational space meant to provide regular classes on VR development as well as a series of industry events. “It’s like WeWork meets General Assembly,” said Freeman, likening the space to both a popular coworking office space provider and an education venture known for its coding bootcamps. 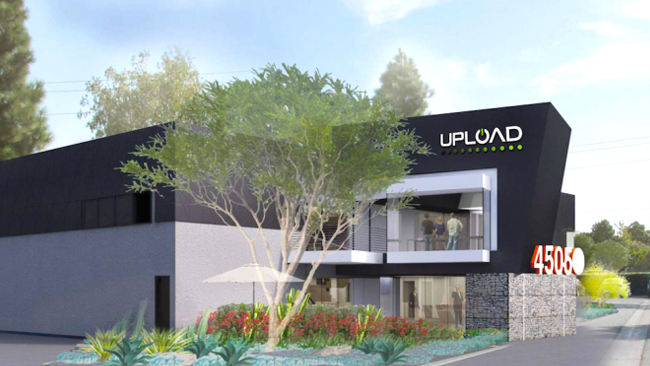 Upload started out as a coworking space in San Francisco, and is also operating its UploadVRnews site that keeps tabs on the nascent VR industry. In Los Angeles, the company is looking to significantly expand its footprint, with enough space to house close to 200 people every day across the education and events space, as well as an open coworking area and dedicated offices. “This is where the center of VR and AR is,” Freeman said about the expansion to L.A.